This ultimate chocolate cheesecake recipe is a chocolate lover’s dream. It has a rich chocolatey taste and a luscious creamy texture. Made with low-fat cream cheese and light sour cream, it has fewer calories than regular cheesecake but tastes just as decadent as you’d expect of a chocolate dessert. This ultimate chocolate cheesecake recipe is a chocolate and cheesecake lover’s dream. It has a rich chocolatey taste with a luscious creamy delicate texture. Almost like a rich chocolate ice cream with a crust. 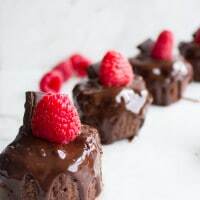 Drizzled with caramel sauce, chocolate sauce or even plain, it’s a decadent chocolate treat that bakes in just over 15 minutes. 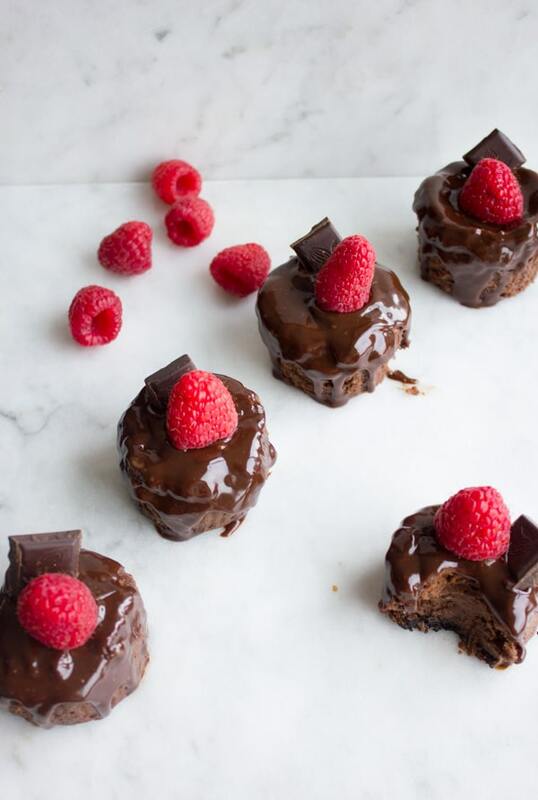 When it comes to cheesecakes, like these mini raspberry cheesecakes, I don’t mess around—they are my favorite dessert and I put all the effort to get them just right. 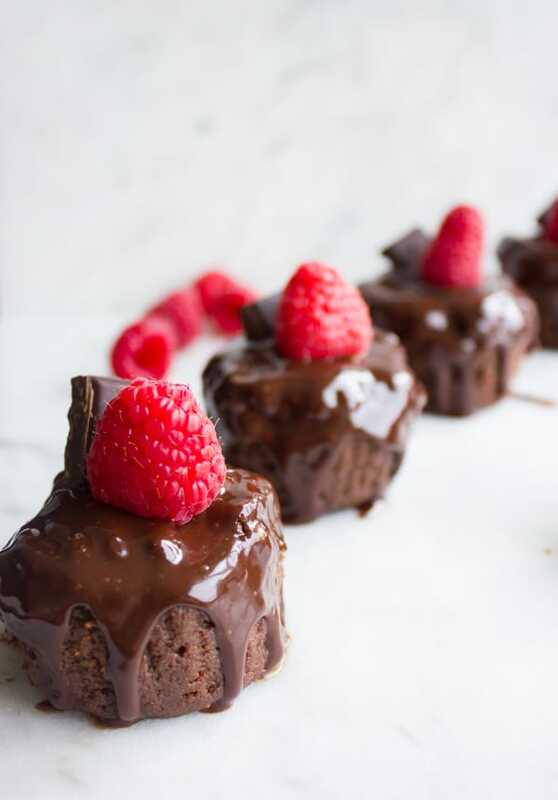 And those mini or single serving sized cakes make the baking time a breeze and eliminate any water bath fuss for baking. The biggest bonus in these chocolate cheesecakes is undoubtedly the chocolate! A rich chocolatey taste, which is not too sweet, rather deep and chocolatey. A chocolate crust which is made using your favorite chocolate cookie (no butter or sugar added, just place one cookie at the bottom of the pan). A filling that is somewhere between a fudge and a mousse, with melt in your mouth texture yet not too heavy or greasy. Rather refreshingly creamy chocolatey and when served cold almost feels like a good chocolate ice-cream. 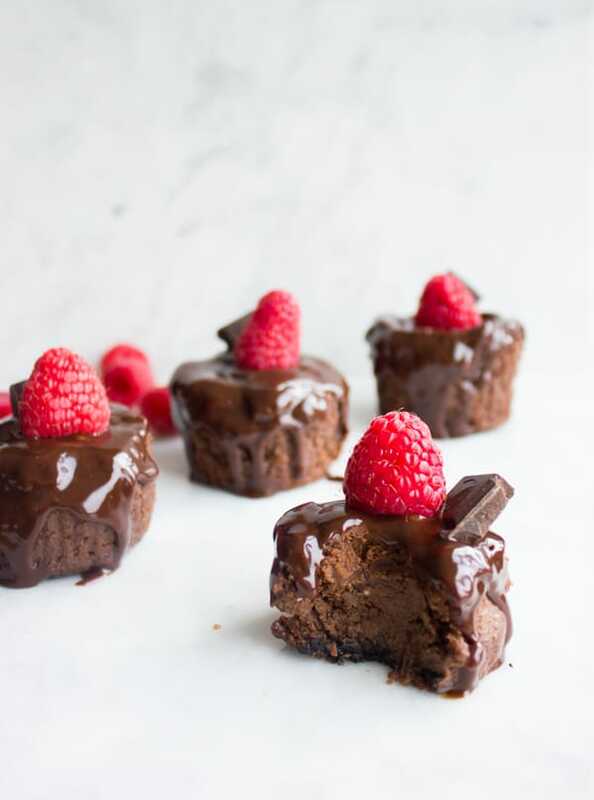 Just like my mini raspberry cheesecakes, this ultimate chocolate cheesecake is made using low-fat cream cheese. It gives me the cheesecake taste I want without the heavy feeling. I also add low-fat sour cream to lighten up the chocolate cheesecake texture, which often tends to be on the dense side. Melted chocolate, cream cheese, sour cream, sugar and eggs are the basic ingredients here. I’ve included 2 tablespoons of cocoa powder which are optional because they give a deeper chocolate taste—so it’s a personal thing. When it comes to flavoring, I always use vanilla, and if I’m not serving this to kids, I will add a tablespoon of espresso for an even intense chocolate flavor, otherwise, I’ll leave it out. Now when it comes to the topping of this ultimate chocolate cheesecake, a plain version is good and a topped version is sinfully good—it’s a decision only you can make! I’ve used my homemade caramel sauce to top some of the cheesecakes, because I nearly always have it on hand (it takes me 5 minutes to prepare and keeps in my fridge for months!) and because there’s something magical about chocolate and caramel when combined together! Another topping I recommend is a simple chocolate ganache made with 2% milk and dark chocolate chips melted in the microwave. 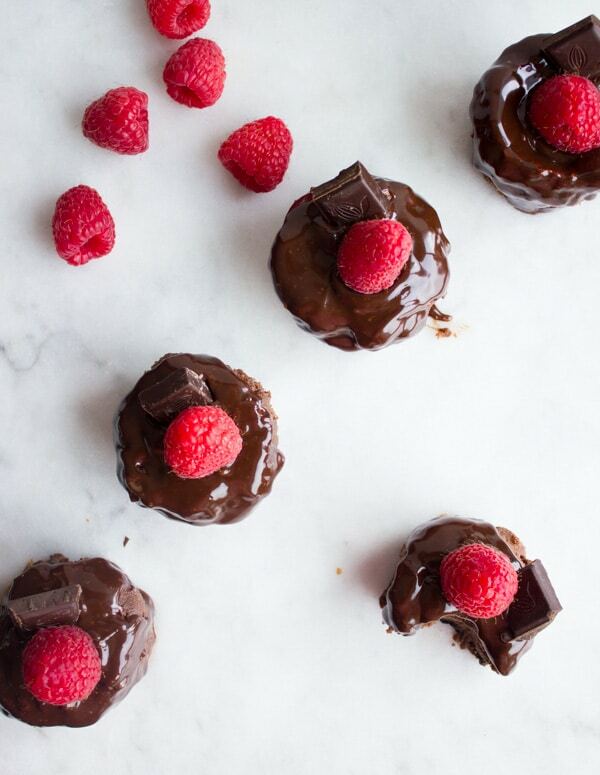 Fresh raspberries add a nice fruity element to these decadent mini chocolate cheesecakes. The beauty and convenience of this ultimate chocolate cheesecake? They taste much better a day after they’re baked—so they’re perfect to prepare in advance for a special occasion. These mini cheesecakes last in your fridge for at least 5 days, so you can enjoy one every day for a week. They’re so chocolatey-satisfying-mood-lifting-long-lasting-happy-making little bites of a chocolate dream. Take your chocolate cheesecake to the next level by flavoring it with orange zest, mint extract, almond extract, cinnamon and whatever you like your chocolate with. Add a tablespoon of espresso to your cheesecake mixture to elevate the chocolate flavor. As tempting as they smell, let these mini cheesecakes cool completely and give them a good rest in the fridge before eating them! They taste so much better that way! This ultimate chocolate cheesecake recipe is a chocolate lover's dream. It has a rich chocolatey taste and a luscious creamy texture. Made with low-fat cream cheese and light sour cream, it has fewer calories than regular cheesecake but tastes just as decadent as you'd expect of a chocolate dessert. 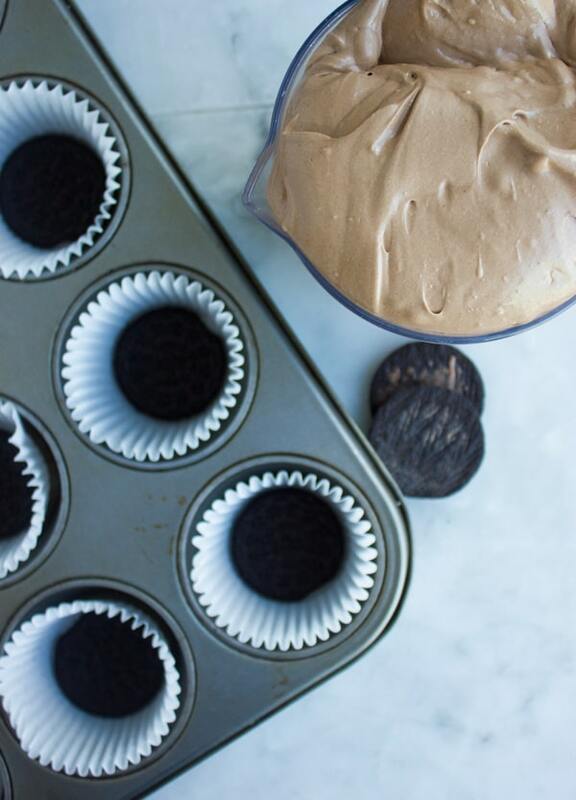 Line a standard size muffin pan with paper cups. Place one cookie at the bottom of each paper cup and press it well so it becomes a crust. In a large bowl, Add the cream cheese, melted chocolate and sugar and mix with a hand-held mixer or a whisk for 2 minutes until the mixture is creamy and smooth. Add in the sour cream, pinch of salt, vanilla and mix again. Then add in the eggs and mix well. Do not over mix after adding the eggs to avoid air bubbles. Pour the chocolate mixture on top of the chocolate cookie crust, dividing it evenly over the 10 cookies. Bake for 15-18 minutes until the cheesecakes are no longer wiggly and slightly puffed. Turn off the oven, open the door and leave the cheesecakes inside for about 30 minutes. Remove them to cool on the counter and then remove each cheesecake with the paper liner and place on a plate to cool in the fridge. Chill the cheesecakes for at least 1 hour to completely form up before removing the paper liners gently. Serve the cheesecakes, cold drizzled with caramel or chocolate sauce or both! 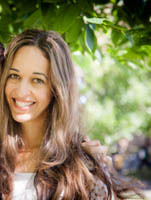 Place the milk in a microwave safe bowl and microwave for 1 minute until extremely hot. Add in the chocolate chips and use a whisk to fully melt the chocolate into the milk forming a sauce. Cool the sauce for 10 minutes and it will thicken as it cools.